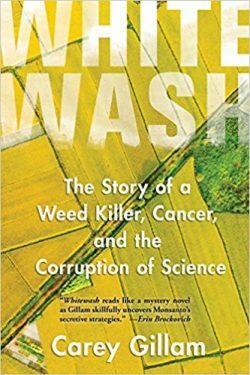 Carey Gillam talks about her book Whitewash: The Story of a Weedkiller, Cancer and the Corruption of Science. We also talk with Philip Ackerman-Leist about his remarkable story of a town that organized and won the right to be pesticide-free. It’s called A Precautionary Tale: How One Small Town Banned Pesticides, Preserved Its Food Heritage, and Inspired a Movement. It’s the pesticide on our dinner plates: a chemical so pervasive it’s in the air we breathe, our water, our soil, and even in our own bodies. It’s glyphosate, AKA Roundup, made by Monsanto, the world’s most popular weed killer. It’s used everywhere from backyard gardens to golf courses to millions of acres of farmland. For decades, glyphosate has been touted as safe enough to drink, but emerging evidence shows just the opposite, tying the chemical to cancers and a host of other health threats. In her book Whitewash, journalist Carey Gillam goes in depth to uncover one of the most controversial stories in the history of food and agriculture. She met farm families devastated by cancers they link to the chemical. She talked to scientists whose reputations have been smeared when they published research that went against Monsanto. She shows how regulators have been captured by corporate interests and reveals secret industry efforts to manipulate public opinion. It all started twenty years ago, when Carey Gillam was tasked by Reuters to move to the midwest as an agriculture reporter. Monsanto had just introduced GMO crops designed to work with Roundup — the so-called RoundUp Ready crops. Her two decades of reporting have resulted in a story of power, politics, and the deadly consequences of putting corporate interests ahead of public safety. A former senior correspondent for Reuters, Carey Gillam is has been covering corporate America for more than twenty five years. Since 1998, her work has focused on digging into the big business of food and agriculture. She is currently Research Director for the nonprofit U.S. Right to Know. When we think of the Alps that straddle the border of Italy and Austria, we think of idyllic meadows nestled below sun-kissed mountain peaks. Tourism is a mainstay of the economy there. So is agriculture. The Italian side of the border is host to one of Europe’s main apple-growing regions — with industrial-scale, pesticide laden orchards — Big Apple — taking over large swaths of the countryside, threatening both biodiversity and human health. But one town said “no” to Big Apple. The German-speaking South Tyrol town of Malz mounted a successful campaign to ban pesticides. 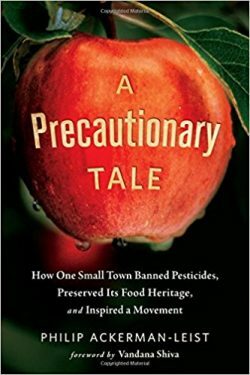 Philip Ackerman-Leist tells the story in his book, A Precautionary Tale: How One Small Town Banned Pesticides, Preserved Its Food Heritage, and Inspired a Movement. Philip Ackerman-Leist is the author of Rebuilding the Foodshed: How to Create Local, Sustainable, and Secure Food Systems and Up Tunket Road: The Education of Modern Homesteader (2009). He teaches at Green Mountain College in Vermont, where he established the farm and sustainable agriculture curriculum.